Pink Gazelle Productions: Authentic Lives…Authentic Works » Do You Love Your Life? Have you ever dreamed of packing up and moving to a Greek Island? Author Jennifer Barclay did just that and shares her experience in her new book, Falling in Honey, Life and Love on a Greek Island. 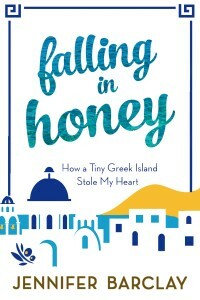 A delight to read, Falling in Honey charts Jennifer’s journey of following her dream and moving to the tiny Greek island of Tilos. Now for me, I find that whatever book I happen to be reading at any given time will often shape what I happen to be experiencing in my own life – usually by shifting my perspective in some way. So it was with Falling in Honey, which I was reading during my not-whatsoever-dreamy Christmas vacation (see The Christmas the Wheels Came Off) in my home on not-so-tiny Vancouver Island. When I collapsed into bed (my couch rather) at night and read a chapter or two of Falling in Honey, I could temporarily put on the back burner the fact that my gravely ill dog was in emergency and my immobile, demanding and oddly hungry mother was in my bed. But escaping one’s reality can only go so far. For while reading about tzatziki and spanikopita, warm sandy beaches and refreshing swims in the sea soothed my soul during a very frazzling time, it also got me thinking about…well, about thoughts – and just how important a role they play in determining whether or not we are in a dream or a nightmare at any given time of our lives. If I have learned nothing else in this life so far, I have learned this: happiness is a choice – a state of mind – versus a guaranteed result that comes from making a change in one’s external circumstances. And yet so many people, myself included, are notorious for fantasizing about how much happier they would be if they lived somewhere else, with someone else, doing something else. And fair enough: maybe they would be. But it’s also fair to say that regardless of where we live, the trials and tribulations of life still happen. They do for me, here in my little bungalow by the sea…and they certainly did for Jennifer on her rather rocky road to serenity. As such, I wouldn’t say Falling in Honey is a reader’s escape from reality. Rather, I think the book holds a deeper and more universally relevant message: home is where your heart is and if you can’t find the real treasure you seek in your own backyard, you probably won’t be able to find it elsewhere. What may need to change first is how you live your life versus where you live it. As it turned out, Jennifer’s heart was on the island of Tilos – without or without a special guy in her life. And because of this, Falling in Honey succeeds in providing exquisite examples of how to experience the joyful simplicities that the slower pace of island life can offer: buying local food, preparing delicious meals, taking long walks, reading in the sunshine, watching the sunset…basically slowing down enough to savour the simple pleasures of daily life versus rushing through the day at breakneck speed. Indeed, the more I read of Falling in Honey, the more I began to salivate – both at the tantalizing descriptions of fresh tomatoes, basil and feta cheese drizzled with olive oil or the warm pita bread dipped in homemade tzatziki and at the delightful sense of serenity that Jennifer’s writing about island life evoked. But then one night, I put the book down, sat up and looked around my living room – and gave my head a shake. Now wait a minute here, I thought to myself: I live on an island. 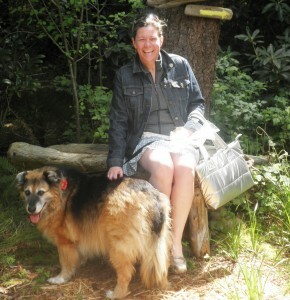 A simpler life at a slower pace had been my reason for moving here in the first place. I, too, had dreamed of being a writer by the sea – albeit the Pacific versus the Mediterranean. But the sea is the sea and writing is writing…and since both are tremendous teachers, I obviously wasn’t a very astute student. Externally, I had all the necessary conditions in place for inner peace. Internally, my stress level indicated I may as well be an investment banker in Manhattan. Ahhh…yes. Although my heart was in Sidney by the Sea, my mind was obviously still struggling to get with the slower-paced program. And that’s okay: awareness is an important first step. Changing – or accepting – one’s self, I’m learning, doesn’t happen overnight. To me, the most beautiful thing about Falling in Honey was how Jennifer made the change in her life that she knew she needed to make – and by finding the courage to do so, she fell in love with life again. And that’s what I did, too, by moving to Sidney. But falling in love with life is rather like falling in honey: sweet as it can be, sometimes you get so stuck in the details you lose sight of the bigger picture. Reading Falling in Honey – and writing about it – helped pull my perspective away from focusing solely on the present, rather sticky, situation by reminding me to see it for it really was: a small but stressful bump on the longer road of the life that I have chosen to take. Perhaps it won’t come as a surprise that Jennifer and I have an interesting history together. She was my first editor on my book, A Widow’s Awakening. Sentence by sentence, Jennifer patiently taught me how to write creative non-fiction. Though we never met in person in all the years we worked together, she painstakingly helped me transform my manuscript from the shattered ramblings of a heartbroken widow into a compelling story. So I return now to Jennifer’s poignant question in the beginning quote of this blog: If you knew you only had one year to live, how would you live it? Well, since I finally figured out that how we spend our days is how we spend our lives, my answer is simple – but not easy: with tremendous gratitude for all that I already have. To read a Q&A interview I did with Jennifer, here is the link. If you’d like to purchase a copy of the book, here’s the link. To read more about Jennifer’s experiences on Tilo, check out her blog, An Octopus in my Ouzo, Life on a Greek Island. Maryanne Pope is the author of A Widow’s Awakening, the CEO of Pink Gazelle Productions Inc and the Chair of the John Petropoulos Memorial Fund. Jennifer Barclay is the author of Falling in Honey and Meeting Mr Kim: Or How I Went to Korea and Learned to Love Kimchi. Jennifer is also an independent editor and literary agent. Please visit her website for details. Great article again. It’s so true you have to yourself to be happy. Even with my dad I was in a bad way and was not happy and I just woke up one day and said my family needs me to be happy. My mom is not in her happy place. Thanks for the comments, Joyce…and that is so interesting how you just woke up one day and realized that your family needed you to be happy! And sometimes it seems that’s the way…we learn to be happy for others, not just for our own sake. Hi Kimberley…SO true about it being a wonderful thought but harder to live! And you are so right in that we only get today once, so we best enjoy it!